The world of birding is full of myths. Some have been handed down for generations, while others have cropped up more recently. Here are a few of the common myths. Hopefully, I can help dismiss these myths once and for all. MYTH #1: Birds will freeze to death when temperatures get well below 0. FACT: Birds are well equipped to survive the coldest of temperatures. They store fat during the short days of winter to keep themselves warm during the long nights. During those freezing nights, they fluff their feathers to trap heat and slow their metabolism to conserve energy. They also look for good places to roost, whether it’s a birdhouse, natural tree cavity, grass thicket, evergreen or shrub. MYTH #2: American robins always fly south for winter. FACT: If there is sufficient food on their breeding grounds, American robins, bluebirds, and a host of finches and owls remain in the area where they spent the summer. MYTH #3: You should take birdhouses down in winter because birds don’t use them. FACT: On the contrary—a birdhouse makes a great roosting house in winter. 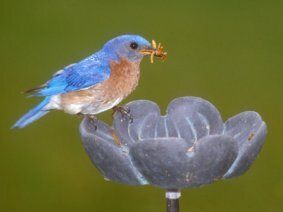 Eastern bluebirds will pile into houses to spend cold nights. One photographer once even snapped a picture of 13 male bluebirds in a single house. MYTH #4: If you leave town during winter, the birds that rely on the food from your feeders will die. FACT: Research has proven this one wrong. Scientists have shown that chickadees, for example, will eat only 25% of their daily winter food from feeders. They find the other 75% in the wild. MYTH #5: Birds always migrate in flocks. FACT: Though many birds migrate in flocks—common nighthawks, American robins, swallows and European starlings, for example—other species migrate alone. MYTH #6 Birds’ feet will stick to metal bird feeders and suet cages. FACT: Most suet cages have a laminated covering, so you don’t have to worry about birds’ feet sticking to it. But in general, their feet can endure cold weather. Birds have a protective scale like covering on the feet, and special veins and arteries that keep their feet warm. MYTH #7: Peanut butter will get stuck in birds’ throats, and they will die. FACT: Peanut butter is a very nourishing food for birds, especially in winter when the production of fat is important to their survival. The myth that it will stick to their throats simply isn’t true. MYTH #8: Woodpeckers drill on house siding in winter for food or to create nesting cavities. FACT: Though there are cases where woodpeckers find food in wood siding (and may even nest inside the boards), nearly all the drilling in late winter is done to make a noise to court mates. This is their way of singing a song to declare territory. MYTH #9: If you have warm water in a birdbath when the temperatures is below freezing, birds will bathe in it and freeze to death from wet feathers. FACT: Birds will drink from a heated birdbath, but if the temperature is below freezing, they will not bathe in it and get their feathers wet.